After trying on several looks today, I finally settled on this one..
What better way than with a sheer kimono that ties at the waist? I bought this sheer kimono from Steinmart a few years ago around Chirstmas time when it was on their clearance racks and I had an extra 50% off coupon, making it around $4. My necklace is a recent purchase from Ebay of the beautful blue stones wrapped in silver. I hope to get several pendants like these and a silver chain for my dear niece as a great way for her to accumualate many colors to indulge her passion for fashion. It’s just a cheap Wet/Wild brand I picked up at Walgreens called, Mink Brown. I wanted to wear flats today, but after a few attempts realized these pointed toe ones worked best with the shorts. My Purse is still available on Just Fab, Here. 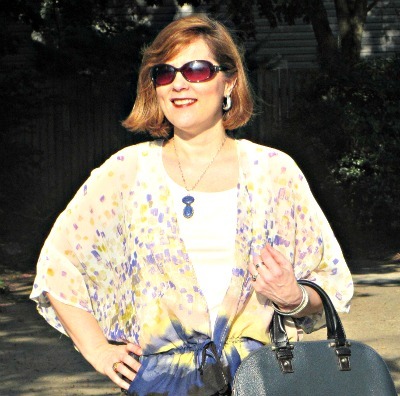 I guess I wore a very similar combo last summer with these shorts and kimono…. Dear Readers, Well, I finished all 4 seasons of Dowton Abbey and can’t believe how caught up in it I became… I think it proved my point about getting into watching entire seasons on Netflix the way the rest of my family does… I won’t be doing that any time soon as I didn’t like how addicting it felt.. I stayed up late, like seriously late… last night I was up unitl 5 am! So lesson learned! Still standing strong and have had no diet soda! I am grateful that I sent the kids out for KFC instead of cooking tonight. I am grateful that my youngest is such a willing photographer and takes doing a good job for me seriously…He actually took this pose from several angles…Looking forward to him taking a photography class soon. 6 Responses to "Dressing my Curves…." Thiis is a great look on you….you have fabulous legs…should wear your skirts shorter (just below the knee) to show them off!!!! I wear skirts of all lenghts.. I have been on a boho kick lately though… I was actually told on a formu last year that I wore skirts that were too short, LOL..Thanks for commenting and encouragiing! Yes, shorts are hard to wear and style for me too, but you look great! Pretty kimono and what a steal!